After three months in Peru, spent mostly in the idyllic Sacred Valley, Santiago has come as a bit of a culture shock. It’s strange enough to be back in a city that was a way point on my journey back in January; and more so, to return at the back end of the winter when previously it was almost too hot to walk the streets. But being surrounded by all the trappings of western urban life – the shopping malls, advertising on every street corner, fast food, expensive cars – after the intimacy and simplicity or rural Peruvian life… this requires a major mental and emotional adjustment. After Peru, Santiago feels rather soulless, and excessively ordered: driving down pavements and ignoring red lights doesn’t work here! Fortunately, I am staying on the very fringe of the city. 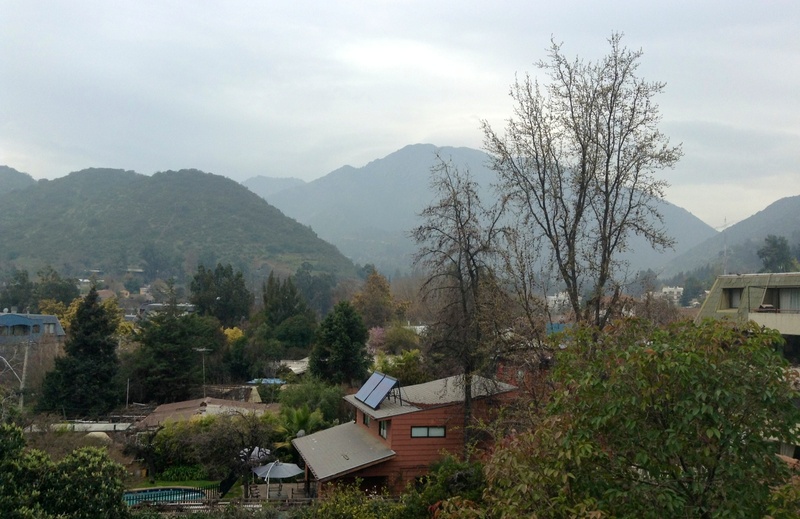 The small balcony of the apartment I am in overlooks the foothills of the Andes, and the mountains are only a 10 minute drive away. A few days ago I took a ride up there, parking by bike at the side of the road and walking up into the hills where the local rock climbers hang out. When I returned, I saw a note stuck to my dashboard. Being back in Chile, I expected to find a parking ticket, or a fine for having an illegible number plate. But it was quite the opposite: it was a note from “a fellow British biker” who lived a few hundred metres down the road, inviting me for a cup of Yorkshire tea. We met up the following day. Meeting people under circumstances such as this has been a common characteristic of this trip. Perhaps it is simply the nature of the people on this continent, who seem so much more open to meeting and helping strangers. And undoubtedly the bike helps, by drawing the attention of fellow bikers and non-bikers alike. After 10 months and numerous encounters like this, I now believe that they are not coincidences – you cross paths with the people you need to meet, when you need to meet them. In February, when I was planning to fly to Peru from Santiago without my bike but didn’t have a secure place to leave it, I met a Chileno and fellow biker in an Argentinian service station, who lived in Santiago. He was admiring my moto as I filled up with gas. When I shared my story with him at the service station, he offered there and then to look after my bike. And it turns out that Martyn, the mystery Yorkshire biker, has a local friend who repairs and services his KTM 990. This guy also happens to build bikes for the Dakar Rally. My bike needs a bit of love and a few modifications – and this guy sounds like the perfect person to do it. I may have solved the problem of finding people to do various bits of work on my bike in one fell swoop. Tomorrow I start what I expect to be a very ‘normal’ lifestyle for a few weeks: attending Spanish classes every day at a school in down-town Santiago, trips to the gym in the afternoons, and weekends free. It’s the only way I’ll survive urban life for two months. Improving my Spanish will offer me a welcome challenge. But the greater challenge will withstanding the daily onslaught of mind-numbing and soul-sapping urbanism – staying out of the malls and saving my money, which I’ll need to get the moto back into shape for the next part of the journey. ADDENDUM: After writing this entry, I later found myself on the moto, pulling up to a junction in a busy part of town. The lights were just changing and as I waited at a red, two Carabineros (Chilean policemen) on motorbikes crossed in front of me. When they saw me on my trusty steed, one of them pulled a wheelie!! Up until that moment, I had staunchly held the view that the Chilean cops were by far the straightest and most boring in South America. This guy made my day! Maybe with cops like him, I can ride down the pavements after all!